WBSC presented an official proposal to have baseball and softball make a historic return at the Olympics! Tokyo Kyodo -　Baseball and softball stated their case for inclusion in the Tokyo 2020 Olympics on Friday, when eight sports bidding for inclusion in Tokyo presented their arguments to Tokyo Organizers. Riccardo Fraccari, president of the World Baseball Softball Confederation, said Tokyo 2020 was a perfect match for the sports given Japan's passion for baseball and its existing facilities. He added that the sports' different organizing bodies are now on the same page. 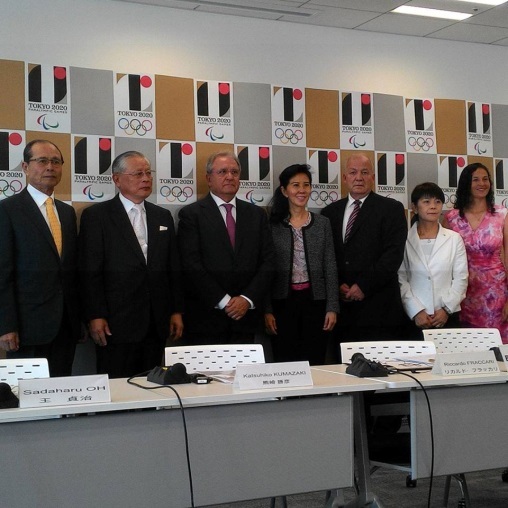 "We learned a lot from the exclusion of our members from the Olympics," Fraccari told a press conference while the international federations of 10-pin bowling, karate, roller sports, sport climbing, squash, surfing and wushu waited to make their own presentations to the Tokyo 2020 Organizing Committee. "One of the reasons that baseball and softball didn't make it in the Olympics was that the professionals were on one side, the international federations were on the other side, the youth movement was on another side. What we have achieved in the last two years is to globalize our sport under the umbrella of the international federation." Fraccari said he was confident about baseball and softball's strong candidacy for 2020, but the real issue is the future -- gaining admission to the core Olympic program after 2020 -- something that has not been helped by Major League Baseball's lack of front-line commitment to the Olympics. This year's Premier 12, he said was a key. "If we (baseball and softball) are in the Olympics in 2020, the 2019 Premier 12 will qualify the eight teams to play in the Olympics," said Fraccari, who called the negotiations with the big leagues about making their best players available for the Premier 12, "very positive." "We want to put into an agreement the same rules about participation in the Premier 12 as in the (World Baseball) Classic. The reason why we have the Premier 12 is because the federations asked us to play more than just one time every four years. The Classic (organized by MLB and its union) is essential to us." Although no details were revealed about the nature of their conversation with Tokyo organizers, an informed source said the day before that should the sports be included in 2020, the WBSC expects up to $45 million (roughly 5.6 billion yen) in ticket revenues to the two eight-team competitions. The confederation also brought along a pair of heavy hitters: Japan's all-time home run king Sadaharu Oh and Olympic medal-winning softball star Taeko Utsugi to further boost its cause. "I want the world to know the joy of playing and watching baseball," Oh said. "Although our desire is strong, we have no say in the final decision to include the sports or not." The legendary slugger crammed the presentation into a busy schedule that saw him throwing out the first pitch the day before at the start of Japan's iconic summer high school tournament, while also overseeing his annual children's baseball event with all-time major league home run king Hank Aaron. Utsugi said softball has been making extra efforts to reach out to youth and the sport's inclusion in 2020 was necessary for that appeal. "After Beijing, we've been trying to promote softball with a focus on children," Utsugi said. "The children now have a high expectation that the sport will be played (in 2020)." Tokyo AP by Japan Today - Baseball called on the Japanese home run king Sadaharu Oh and karate used a live demonstration as eight sports made their case Friday to be included on the program for the 2020 Tokyo Olympics. Baseball and softball are making a combined bid. The other sports making presentations to organizers were squash, surfing, bowling, roller sports, sport climbing and wushu. After the presentations are finished on Saturday, Tokyo organizers will make recommendations to the International Olympic Committee by Sept. 30. The IOC will make a final decision on which sport or sports will be added in August 2016, when it meets ahead of the Olympics in Rio de Janeiro. Men’s baseball and women’s softball, sports that were dropped after the 2008 Beijing Games, are considered favorites because of their popularity in Japan.